WASHINGTON, DC--(Marketwire - Feb 20, 2013) - Prohibition may have been in full swing when The Mayflower Renaissance Washington, DC Hotel opened in 1925, but for the 88th Birthday on Monday, February 18, the bubbly was flowing! Toasting to over eight decades of elegance, the hotel shared a legacy of celebrating past Presidents from inaugural balls to other social occasions. This year promised to be more festive as the hotel's 88th fell on President's Day, celebrating the birthdays of George Washington and Abraham Lincoln. The Mayflower Renaissance's signature Fete Cuvee sparkling wine, blended by Iron Horse Vineyards in participation with the property, was served on February 18th in the lobby. Chocolate caramels were gifted upon check-in as a sweet surprise. This birthday marks a particularly exciting time for the 4 star hotel, which has undergone a series of renovations over the past year. The grand lobby has been renovated and meetings and events have a new home in the Promenade Ballroom, which has added over 3,000 square feet of event venue space. After much anticipation, The Mayflower Renaissance has also welcomed a new bar and restaurant - Edgar Bar & Kitchen opened at the end of 2012 and has become a popular place for drinks with its couture cocktail menu. Long considered "Washington's Second Best Address," The Mayflower Renaissance Hotel is just a few blocks from the White House and vibrant DuPont Circle. The hotel is ideally situated in the heart of the business district, surrounded by entertainment, culture, shopping, and dining destinations. 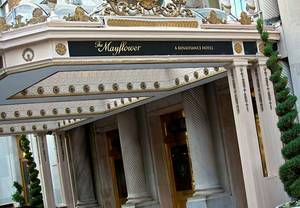 The Mayflower Renaissance hotel is located at 1127 Connecticut Avenue NW, Washington, DC, 20036. For reservations, please visit http://www.marriott.com/hotels/travel/wassh-the-mayflower-renaissance-washington-dc-hotel/ or call 888-236-2427. Stay up to date on all the celebrations by visiting The Mayflower's Facebook page. Renaissance Hotels represents a diverse collection of more than 151 hotels in 35 countries worldwide. Each property is unique, offering passionate travelers a one-of-kind experience and memories they will be sure to take with them long after they depart. Within every hotel, guests are greeted by an exceptional array of amenities and an inspiring world of local discoveries. For travelers looking to experience something new, innovative and locally driven programs including the industry leading entertainment platform RLife LIVE as well R Navigator, ensure that every trip is transformed into an eye-opening, unforgettable journey. Renaissance Hotels. Live Life To Discover. To discover more visit www.renhotels.com. Prohibition may have been in full swing when The Mayflower Renaissance Washington, DC Hotel opened in 1925, but for the 88th Birthday on Monday, February 18, the bubbly was flowing! Toasting to over eight decades of elegance, the hotel shared a legacy of celebrating past Presidents from inaugural balls to other social occasions.